When a woman enters public space, she draws an invisible pattern of a magnetic field. Vectors of gazes are pointing to her: the public space is the space of appearance, it is here where she is expected to perform. In 2016, during a typical design studio project in our Masters of Architecture at KU Leuven, we were asked to design housing units for the city of Karachi, Pakistan. The project brief called for “high density in an ever-expanding city,” but our feeling was that before master-planning for a context none of us had ever visited, we should understand the embodied experiences within the current living conditions. With my colleague, Vytautas Lelys, we soon turned our project into a study of the gendered division between domestic and public space in Pakistan. Expanding on notions of care/labour and re/production developed by material feminists and embedded in this spatial dichotomy, our research focused on the link between women’s location and respectability and on the expectations projected upon the female gender. The form and service-oriented character of the architecture studio culture often refers to a vague group of “inhabitants” who would need a certain amount of square metres, with the success of a project measured by the density achieved with each housing block. Instead of using this quantitative vocabulary, we focused on the assumptions made about our own design tools and about our imagined clients: How are privileges, expectations and power relations distributed in space and how do they shape spatial experience both through and beyond the work of the designer? Our project developed around an extended email and video interview which we conducted with Sadia Khatri from Girls at Dhabas, a Karachi-based feminist group concerned with women’s participation in public space. Dhaba is the name given to traditional teahouses, cafes or canteens in Pakistan and India. Although they are typical roadside restaurants, they are largely used as male-dominated hang-out places, with women and family sections in separate, less visible areas. Girls at Dhabas was created as a platform for women who were visiting these tearooms and spontaneously uploading photos that they took of themselves on social media. Although inspired by their arguments, our project was not a design for the Girls, but rather a journey into the limits and assumptions of architectural discourse. While we were consciously moving away from and challenging the design brief into a topic that was dismissed as non-architectural by our (female) studio leader, we had the feeling that we were becoming part of an international feminist conspiracy. In the architectural education culture, a final critique is often a moment of self-exposure and judgment. Similar to entering public space, it poses the challenge of defending one’s position. In the final presentation of our studio project, I remember the audience, which consisted of the studio leader, two teachers, a guest jury member and fellow students, looking both amused and uncomfortable. Instead of the expected floor plans “for high-density housing units” submitted by other students, the project that Vytautas Lelys and I developed was for five interventions into an existing housing block which we called “provocations.” There was a rooftop garden called Hortus Conclusus or “Enclosed Garden” that was meant to be used only by female residents of the apartment block, the Communal Kitchen, a semi-public kitchen facility for two adjacent apartments, the Dhaba with Daycare, a female-run dhaba on the ground floor with a kindergarten for the children of women who wished to work outside of the house, the Unisex Toilet, a gender-neutral toilet in the aforementioned dhaba, and the Cursing Booth, a structure similar to a telephone booth that could be used by men who want to swear in public (the presence of men swearing is one of the things that prevents women from visiting places such as dhabas). Instead of using detailed architectural plans, we illustrated the interventions with renderings and accompanied them with quotes and comments from our research and the interviews we had conducted. We proposed these five interventions for an apartment block called Fahad Square, selected from a list provided by our teachers. The Fahad Square apartments were contained in two housing blocks, one U-shaped and the other rectangular, spread over four floors, organized in symmetrical clusters, and accessed by an open-air corridor on the interior, private side of the U-shape. The ground floor featured commercial activities along the exterior perimeter of the complex, including dhabas. Based on material which was included in the list, photos, and interviews with the inhabitants, men frequent the ground floor and exterior of the building, while women (the majority of whom work from home or do not have a job) and children spend their time either at home or socializing in the connecting corridor or the backyard. The gendered socialization patterns revealed in the interviews inspired us to start our own further research. Our interventions raised the issue of women’s visibility within the existing housing complex and the relation between the private and the public. They were schematic, strategic, and partly ironic. Enacting their role as “provocations,” they sparked a vivid discussion about how these interventions would be received even in Europe. According to the majority of the jury, though, they remained on a conceptual level that lacked architectural detail. According to the studio leader, the task of an architect is to provide formally sound and precise building solutions, and she was concerned about whether our proposal sufficiently satisfied the project brief. For us, the provocations expanded the notion of architecture within the studio culture. Their purpose was to organize daily life and its spatial distribution. With their titles and programmatic instructions, the five interventions acted as textual protocols which defined the conditions for spatial occupation and the relations and potentialities of the bodies within it. Floor plans of the Fahad Square apartment block. Drawing by Lydia Karagiannaki and Vytautas Lelys. Our interest in gendered notions of domesticity led us to diverse readings, from historical experiments for emancipated households to contemporary design and artistic projects with an actual impact on people’s lives. One of the main issues of a gendered reading of domesticity is its connection with reproductive work, which is largely invisible and always unpaid. In her “Manifesto for Maintenance Art” from 1969, Mierle Laderman Ukeles notes: “I am an artist. I am a woman. I am a wife. I am a mother. (Random order). I do a hell of a lot of washing, cleaning, cooking, renewing, supporting, preserving, etc. Also, (up to now) separately I ‘do’ Art. Now, I will simply do these maintenance everyday things, and flush them up to consciousness, exhibit them, as Art.” (1) In response to the invisible and time-consuming character of housekeeping labour performed traditionally by women, there has historically been a variety of projects that respond to this issue within diverse cultural and ideological contexts. Urban historian Dolores Hayden's book The Grand Domestic Revolution offers an extensive account on both realized and unbuilt housing projects, developed by material feminists during the nineteenth century in the United States, that sought to re-organize interpersonal relations and to collectivize the task of housekeeping. This inquiry finds its contemporary counterpoint in Anna Puigjaner’s research project Kitchenless City, a collection of case studies from around the world in which the tasks and spaces of cooking, as the main reproductive activity, are equally collectivized. Moreover, female architects have advocated for women’s issues through various activist and consultancy groups. For example, during the 1980s in the United Kingdom, the Women’s Design Service and the Matrix Feminist Design Co-operative were community technical aid centres which promoted a feminist agenda in architecture and urban planning through consultancy and publications. The situation in Pakistan, though, remained vague to us. Pakistan is a country with a variety of cultures and specific cultural experiences, which makes it challenging to talk about women’s issues without referring to a certain culture, region and class. What anchored our research to a specific context, was our discovery of Girls at Dhabas, a Karachi-based feminist group concerned with women’s participation in public space. The group seemed to represent a certain part of modern Pakistani society: young activist city dwellers, probably part of the “educated middle class,” concerned with their representation and participation in public life. Several weeks before the final presentation of our studio project, my colleague and I arranged a video interview with Sadia Khatri, a young journalist based in Karachi who is the co-founder of the group. 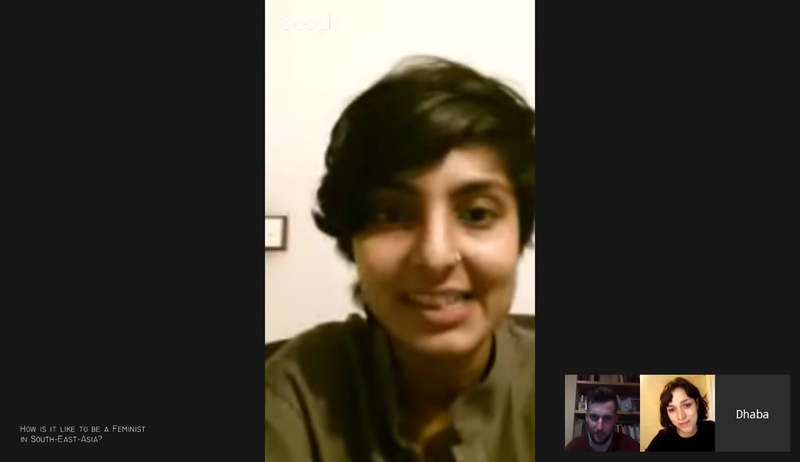 After approaching her through Facebook followed by an email exchange, Sadia agreed to tell us more about feminism in South Asia and the group’s approach. We saw this as an international feminist conspiracy coming together in the virtual meta-space. The idea for Girls at Dhabas had come to Sadia as she was uploading photos of herself in dhabas on social media. The photos attracted reactions especially from other women from various South Asian countries. Some of these women started uploading their selfies taken in spaces not normally occupied by women. A loose and widespread network of people developed, with a core team situated in both Karachi and Lahore, all sharing concerns around issues of women’s participation or experiences in public space. Girls at Dhabas operates on multiple social media platforms, such as Facebook and Instagram, where they upload and comment on hashtagged photos and share articles on feminism and gender politics. Experiences in the dhabas are the core focus of a more general discourse on women in public space. The activism carried out by the Girls at Dhabas is guided by two key positions. The first is the promotion of “loitering”—enjoyment-driven drifting through the streets of the city without apparent purpose. (2) According to Sadia, although women are widely seen walking the streets in Pakistan, entrenched patriarchal structures legitimize oppression and violence according to the purposefulness of women’s being in public. While women may be in public space when they have a clear purpose—generally commuting to work, walking in shopping streets, strolling through malls or taking their children to school—they are not expected to occupy public space without justification. The joy of a simple walk or social interaction are generally not adequate reasons for using large parts of public space. Middle and upper-class women, in particular, are expected to carry out these activities in the home or in other private or curated spaces, such as gated communities and family parks. Through the act of loitering, Girls at Dhabas challenge this norm and provide their version of the typically male flâneur. They reclaim the streets not in order to consume, but with the strict purpose of drifting, of being there without a clear purpose. Second, Girls at Dhabas acknowledge the impossibility of defining a universal understanding of feminism even within the borders of one country. Forms of oppression, violence, and emancipation differ across individuals and groups, and there are multiple intertwined categories beyond binary genders that fundamentally change a person’s everyday lived experience. Women of colour, for example, might be more vulnerable to street harassment. Similarly, while working-class women are generally more visible in public space, middle and upper-class women are discouraged from being viewed in public, since visibility and location are linked to cultural perceptions of respectability. As Sadia notes, by acknowledging the intersectionality of any feminist emancipatory struggle, Girls at Dhabas can create a community that shares feelings of empathy and trust among members of different backgrounds. Where or how to draw a line between the private and the public is not only an architectural question but also a political one. To paraphrase Jacques Rancière, the built environment (and politics in general) is about the configuration of the visible and the abilities of bodies within it. (3) As the arguments of Girls at Dhabas suggest, patriarchal structures are able to restrict the abilities of female bodies through the construction of a strict spatial dichotomy imbued with ethical connotations. The domestic territory is the place of invisibility and therefore respectability, while the public territory is the place of the visible and the disrespected body. To choose to appear in public is to consent to be exposed and vulnerable. Within the walls of the domestic lies the history of the architectural veil; removed from sight in order to preserve her mythical sacredness, away from dangers and temptations, only then can a woman claim her right for dignity and respect. Our skin, our clothes, the walls around us, they are three layers or borders for the protection of the Self. Yet the doctrine of “protection” is an expression of commodification, of the assumption that the Other is incapable of preserving her own integrity. The veil—either the cloth or the architecture—–becomes an instrument for the maintenance of a specific power relation according to a regime of the visible. It is a protection against the gaze and, in this case, the gaze is gendered: from the man as a viewer to the woman as object/commodity. Recent and historical examples of forced unveiling in the West only repeat this commodification of the female body; women are criticized for being too independent or not enough, for being too covered or too exposed. It is remarkable how the moral obligation for protection against this gaze falls on the side of the objectified body, how the body which fails to comply with the rules is rendered unexcused and is punished. The performative actions of Girls at Dhabas draw attention to the performativity involved in the construction of gender identity and to the actions which constitute womanhood. When a woman enters a dhaba, she is not only entering a place where she is not expected to appear but a place where she essentially cannot appear. Entering the public space means entering the public life and becoming a political subject. The activism of Girls at Dhabas is essentially spatial: They produce new cognitive spaces of interaction and becoming by shuffling and reorganizing gendered expectations of appearance and re-territorializing their ethical connotations and narratives. In this way, the actions of Girls at Dhabas are strategic, transgressive performances. The Girls openly enter places specifically designed for men to purposely “hack” the built apparatus that otherwise hides women from public view. They challenge the link between visibility and respectability. They choose to be visible, exposed, vulnerable. They reverse the vectors of the gaze: moving out of the domestic and into the public, they move from objects to spectators. If the transgression of the border of visibility is the first action of their emancipatory struggle, its immediate and extensive online documentation through selfies made by the women themselves is the most cunning part of the Girls’ activism. While appearing in a dhaba addresses the audience that is physically present at a specific moment, appearing online addresses an audience beyond a specific time or place. When women share their selfies from male-dominated places on social media, they go beyond mere self-fashioning through photography: they draw attention to the representational level, to the ways we see and codify information and to the modes by which we relate to what is being seen. Staring at ourselves in a room filled with men, we turn our gaze from ourselves as women to the gaze itself. Through the self-exposed female body, we are confronted with the apparatus of oppression set by patriarchal structures. We enter the regime of the visible as something felt and experienced, as a neurotic attempt at containment through the construction of guilt. Shame is carried in the gaze, but for whom? The Girls’ public self-exposure to everything they have been told is dangerous, the overthrowing of their supposed vulnerability renders obsolete the regime of fear and control preached through generations of patriarchy. Looking at us through their online photos, masterfully reversing the gaze in some instances, they are creating their own image and subjectivity. “The Cursing Booth.” Drawing by Lydia Karagiannaki and Vytautas Lelys. Architects, universities and ideas competitions often tend to isolate social challenges in their design dimension. But to state that design in general—and specifically architecture—suffices in effectively intervening in and altering structural inequality is not only wrong but dangerous. It fails to acknowledge the complexity that underlies the causes of problems and legitimizes the absence of political will to effectively intervene. It fails to address our own personal involvement in the maintenance of inequality through the unconscious reproduction of ideas and practices. Inequality and oppression will not be solved by improving power relations through design, but by decisively uprooting them. Power structures are sustained by complex apparatuses of material and immaterial infrastructures, space being only one of those components within a larger engine. Beyond the design of forms there is the design of relations, set in place by legislative documents, political interests, and cultural traditions. Can we acknowledge these tension fields in which we are always called to operate and uproot the idea of an innocent and objective architecture by foregrounding structural and program-oriented changes in our designs? Can we raise the question of our responsibility as designers, beyond generic design briefs, by looking at our own context, methodologies, surroundings, and assumptions about them? There has been a recent turn in architectural academia towards program-oriented approaches and pedagogies, addressing topics of gender, queerness, and community. Academics and initiatives such as Jane Rendell, Doina Petrescu, FATALE at the KTH Stockholm, or GSAPP’s QSPACE, to name only a few, focus on topics of performativity, subjectivity, collectivity, and decolonization. By employing feminist ethnographies, they push the limits of architectural discourse and reflect on the ability of design to support or challenge established power relations. Faced with the impossibility to actually intervene in the everyday experiences of the people whose images we were following on the screen, my colleague and I turned our attention to our own practices and tools. By seemingly talking about Pakistan, we were actually talking about ourselves, reversing the gaze towards the modes we design and think of as alternatives, towards the quantitative criteria for designing houses and cities and our western viewpoint about life on the other side of the world. By scrutinizing the assumptions which underlie spatial organization in a very precise context, we analyse the ways in which space is produced, not only by the designer but also by the user. By way of a case study of an existing housing block, our five spatial interventions act as five provocations for the meta-space of architecture studio critique. The Communal Kitchen, as semi-private and visible space on the side of the interior corridor, opens-up the small, claustrophobic private kitchen of the Fahad Square apartments to address themes of fragmentation, (in)visibility and the value of house-work. The Dhaba with Daycare is based on an idea of Girls at Dhabas, a space which deconstructs the male-dominated character of its typology and provides a job opportunity for mothers who are isolated at home by their role as caretakers. The Unisex Toilet is a reaction to the performative aspect of the construction of gender identity, a question about whether our gender defines the spaces we visit, or whether it is space itself which constructs our identity. The Cursing Booth acts as an irony of over-identification: If men prevent women from visiting places where men are swearing, those places could be equipped with the device of a booth which captures inappropriate vocabulary and purifies the soundscape for respectable women. The Hortus Conclusus highlights the distinction between compulsion and free choice. Unlike a family park, it doesn’t impose itself as the only safe female place, but it offers the opportunity for separation within a larger composition of welcoming spaces. The sixth part of the presentation consists of our email exchange with Sadia, printed and presented as censored letters. Her words function as departure points for discussion: their selective veiling re-enacts their muting by those who decide (and build) for her. The commentary is dismissive, but it is also (partly) true: Girls at Dhabas are indeed representative of their context, and they also know how to draw attention. But isn’t this the power of their activism, their deliberate contextuality instead of a supposed universalism? Aren’t they speaking about their own, legitimate experiences, challenging a generic studio brief? And don’t they force us to similarly look into our own intertwined contexts and privileges, into the roles we are called to fulfil? I am also privileged in being able to read and write these lines. I am privileged in having access to the internet and being able to comment on Girls at Dhabas. I am privileged in that I can choose how to dress and where to loiter. I am privileged in having received an architectural education. But I do not need to be ashamed of my privileges. Privileges are weapons in the struggle for emancipation, they are channels carrying unheard voices, magnifiers of silenced songs. “The Hortus Conclusus.” Drawing by Lydia Karagiannaki and Vytautas Lelys. (1) Mierle Laderman Ukeles, “Manifesto for Maintenance Art, 1969,” posted by Arnolfini, accessed October 20, 2018, https://www.arnolfini.org.uk/blog/manifesto-for-maintenance-art-1969. (2) The main reference given by Sadia Khatri in our email exchange was Shilpa Phadke, Sameera Khan, and Shilpa Ranade, Why loiter? : Women and risk on Mumbai streets (New Delhi: Penguin Books India, 2011). (3) “Politics, in general, is about the visibilities of the places and abilities of the body in those places, about the partition of private and public spaces, about the very configuration of the visible and the relation of the visible to what can be said about it.” Jacques Rancière, “Ten theses on politics,” trans. Rachel Bowlby. Theory & event 5, no.3 (2001). Lydia Karagiannaki is an architect and researcher based in Brussels and working internationally. Through community-led design, artist’s residencies and curatorial projects, she explores spatial practice and territorial interventions as a tool for identity construction and interrogation.